When Carrington Brouwer receives the enviable job of painting carousel horses for a factory in Ohio, she believes her future is secure. But after an expensive necklace disappears from the home where she's been staying, she's caught up in a search for the truth that puts her entire livelihood--and her developing relationship with the factory manager--at risk. Can she lead police to the real culprit before she loses everything? I love Judith Miller, but most of the books I've read she's cowritten them with Tracie Peterson. I was so happy to receive this book from Jim at Bethany House Publisher to review. I again didn't read the back of the book so I had no idea what the story centered around. I would encourage you to try this if you haven't done it before. For me it adds intrigue to the story and makes the opening up of the storyline more interesting. Carrington Brouwer has just arrived in the United States after being gone for a number of years to Paris while her father became a well known artist. He has passed away and Carrie finds herself at the home of one of her father's student's whom she befriended, Augusta. One of the things I love about Carrington is that she is always wanting to laugh at the wrong times, mostly because she's uncomfortable or upset. I deal with that a lot myself...in fact it happened today at church (Sunday). There are a couple of other situations that Carrington finds herself in that I could really relate to such as wondering if she should apologize and when to do it. I also deal with struggling in my walk as a Christian. I think so often that this or that person would do everything so much better than I would because they're a better Christian than me. I appreciated how Judith developed this character! Right off the bat I couldn't stand Mrs. Galloway. She was uppity and only concerned about outward appearances. I was also excited to find out if the author was going to give our wonderful female character, Carrington Brouwer, a man to tame in the form of Tyson. You know how authors do it, the seemingly aloof and somewhat annoying man enters the story but turns out really be a good guy at heart. Carrington is given the job of painting carousel's at the kind Mr. Galloway carousel factory. The men at the factory are mad having a woman in their midst and some decide to quit. Carrie doesn't have an easy time proving herself to those she works with, but soon starts showing her talent. The wives of the men are just as furious that a woman is working with a man. How dare she take jobs that men should have to take care of their families. And of course she' probably trying to steal their affections! What kind of woman is this Carrington Brouwer? I found The Carousel Painter to be a very fast read for the fact I couldn't put it down! All the trials that Carrington had to go through almost daily made me want to turn each page as fast as possible! Judith Miller is an award-winning author whose avid research and love for history are reflected in her novels, two of which have placed in the CBA top ten lists. 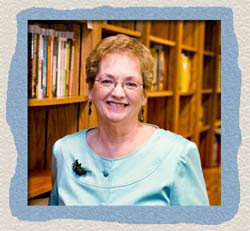 In addition to her writing, Judy is a certified legal assistant. Judy and her husband make their home in Topeka, Kansas. Visit her Web site at http://www.judithmccoymiller.com/. 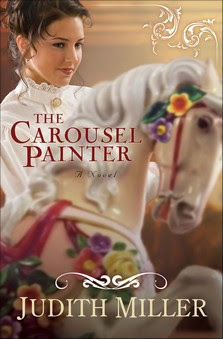 If you'd like to learn more about The Carousel Painter and other great Bethany House books, visit them their website http://www.bethanyhouse.com/. I sure do love the cover for this one! I'm glad to hear it's a good read! Thank you for sharing!